May 9, 2018 at 3:00 p.m.
in the Berrie Center Sharp Theater. 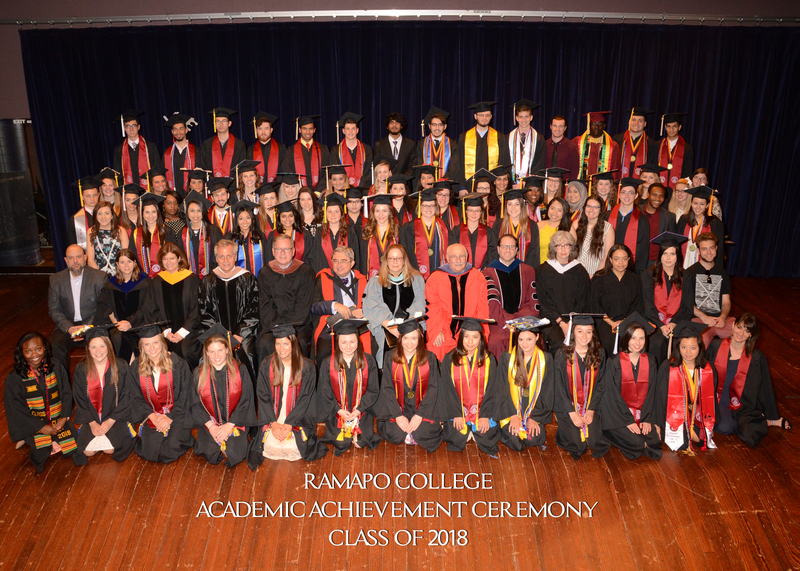 The Academic Achievement Ceremony is held each year in May on Arching Day and acknowledges the outstanding academic achievements of undergraduate students at Ramapo College. Each year one student in each school is selected to receive an award in these categories: Outstanding Academic Achievement in a Major (prize donated by AFT), Ramapo Undergraduate Book Prize for Academic Excellence, Faculty-Student Research. Additionally, one Ramapo student campus-wide is selected for specially donated awards: AFT Graduate School Scholarship, Henry J. Frundt Memorial Scholarship, NASW Social Work Scholarship, Herbert Wortreich Award, and the Lee Sennish Award. As we continue to admit students who are better prepared for the rigors of college, students honored at this event are more and more likely to be among the most outstanding. These students are recognized for their specific as well as more general intellectual achievements. The Office of the Provost would like to recognize the gracious assistance of all whose work makes our acknowledgement of student achievement possible today. We would like to thank the deans, conveners, and faculty who took the time to assess carefully the contributions of students considered for these awards. Our greatest appreciation is extended to those students honored today and to the many students whose achievements made the choice of honorees a difficult one. Their excellent academic achievement and co-curricular activities are the life of Ramapo College.